American Group awarded DHE their 2018 Western Region Carrier of the Year. 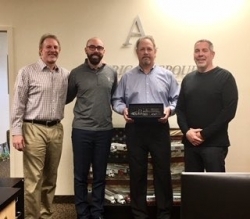 Phoenix, AZ, March 05, 2019 --(PR.com)-- American Group awarded their 2018 Western Region Carrier of the Year to Dependable Supply Chain Services dba Dependable Highway Express (DHE). The award is based on a number of key performance indicators, including On Time Service, Invoicing Accuracy, Low Claims Ratio, Customer Service, and a variety of other factors. Accepting the award on behalf of Dependable is Eric Heuschele, Enterprise Account Executive. Presenting the award on behalf of American Group are Daniel Krivickas, Jr. (President), Nick Heisterkamp (Director of Carrier Relations), and Michael Schember (CEO). "We're proud to present this award to our carrier partner, DHE. They have proven to be an excellent provider for us, not only in the Western Region, but also as they have expanded their service offerings to states beyond the Western Region," stated Daniel. "Additionally, their service offering to Hawaii is top notch, and we are proud to be partnered with them." About American Group: Founded in 2006 and based in Chandler, American Group is the 2nd largest privately held 3PL in Arizona. American Group offers a variety of services, including less than truckload, full or partial truckload, intermodal, import/export, ocean/air, freight bill auditing, and claims filing assistance. Using their state-of-the-art TMS, and offering customizable solutions to their clients, American Group is able to truly deliver on their signature, trademarked tagline: Shipping.Simplified.